The recurrent cry for protecting the environment is never heard by some real estate companies. The grabbing of marshy lands and rivers has been a common practise for them. The construction of buildings not maintaining the building code is nothing new. They should keep in mind the tragedy of Haiti where the scientists found building corruption to be the core cause of the massive destruction. Is it not their duty to be responsible citizens? We urge the concerned authorities to take effective measures against them. There was hardly enough space to stand on the cramped shuttle train. As the last whistle blew, and the train started to move away, I watched the large number of students left behind on the platform, disappointed, because they were unable to board the train. These students, I knew, would have to look for alternative modes of transportation, such as CNGs, buses, rickshaws etc, which are difficult to get hold of and extremely costly. This is the story of the students of Chittagong University, which stands 22 km away from town, hence the need for this shuttle train, which brings students to and from the campus for their classes. However, because of the shortage of space, most students cannot take advantage of this facility. Some students, when desperate enough, will ride on the roof of the train, ignoring the risk of doing so. I would like to draw the attention of the relevant authorities to this matter and request them to increase the seating arrangements by adding new compartments to this train. As the World Cup begins, the excitement mounts. The Bangladesh team have performed remarkably well in the past. A true miracle is really possible this time too if we can believe. We must try to remember that believing means winning. However, sometimes we fail to encourage our players. Although we are a decent audience we lose hope pretty early in the tournament. The players can excel in the game if they get proper motivation and inspiration from their supporters. It is our time to outplay the cricket-giants of the world. It is time to be recognised as roaring tigers one more time. This time we can wave the red-green flag in victory. It is our own not Brazil's or Argentina's flag. It would not make sense not to hoist our own flag in this glorious occasion. If we can arrange a perfect glamorous opening, we can stage an equally wonderful performance on the field. I would like to wish our players good luck and hope for the best. A hartal day is a peculiar day, peculiar because it is unlike any other normal day of the year. Normally, we have some daily routine to follow. Some for example have office; some have their business and so on. In a nutshell, the daily demands of life drives people onwards their regular way. But what happens to them on a hartal day? People who receive wages for their daily work such as day labourers cannot feed their families. Those who work at government or multinational companies enjoy an unauthorised leave at home. The whole country comes to a standstill. It is risky for people to venture out because of road barricades, vandalism and riots. The opposition may think a day like this is a successful day for them, but they should know that it is a failure for the rest of the country. Everytime they call a hartal, they hold back the nation a little more from progress and development. 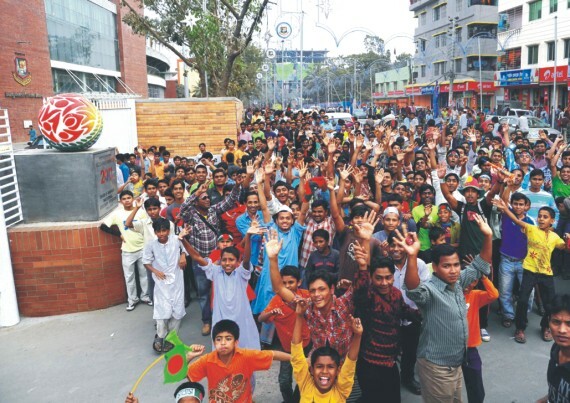 Bangladesh is now a proud host of the ICC World Cup Tournament. 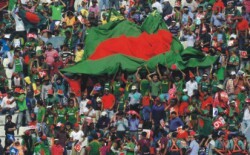 Games will be held in Dhaka and Chittagong. To celebrate this properly and present our country in a positive light to the world; the government has taken some initiatives to make Dhaka and Chittagong neat and clean. All old and broken roads and footpaths are now newly renovated; there is an improved garbage delivery system, car parking system, and also all hotels are now bright and newly painted, and streets are sparkling with lights. Moreover, recently, the Mayor of Chittagong came up with a new system of providing all beggars with a monthly fee, so they don't have to beg on the streets. The whole city is now ready to celebrate the event beautifully. We, the city dwellers have always dreamt of a neat and clean city, but unfortunately the city is not always properly maintained. We are always deprived of our basic right of living in a clean and healthy environment. On this context, I would like to draw the attention of the government as well as the Dhaka city Mayor to maintain this standard of cleanliness even when the World Cup matches are over.